The Design Culture Lab at Victoria University of Wellington, New Zealand is run by Dr. Anne Galloway, an academic researcher whose inquiry takes the form of texts and photographic documentation, as you might expect of someone originally trained in anthropology. But you might not expect some of the other forms her lab's work creates: artificially grown meat products; felted wool dinner entrees; a fictional government ministry and public program; a textile cast for a broken limb literally knitting its hard-soft structure together. These are all part of a three-year research project called Counting Sheep: New Zealand Merino in an Internet of Things. Galloway's work is aligned with what's often called speculative design, or design fiction. It is essentially creative cultural research, rooted in designed artifacts. The designs aren't intended to solve user-based problems or needs; they're not meant to result in manufactured products. They're created instead to ask provocative questions, to pose future scenarios that are partly fact and partly fiction, and to form bridges between academic and popular debate around important technological, cultural and socio-political issues. Because these visions are based on people's lived experiences, and created for public engagement, Galloway refers to what she does as "speculative design ethnography." It's the BoneKnitter, above, that caught my eye with Abler in mind. It's a speculative design for a new-old cast for a broken bone, made from three different layers of wool to maximize its structural properties when alternately woven more tightly or more loosely. Galloway and her team imagine it infused with traditional healing substances of the Rongoā Māori—medicines made from New Zealand's native plants, developed by the Maori peoples—and completed with data histories for the merino sheep whose wool has been used to form the cast. It proposes a future technology with roots in naturally-evolved materials and culturally traditional practices. I had an immediate response to this imaginative object—its beauty and its semi-plausibility. After all, doctors literally speak of bones "knitting themselves" back together, and the intrinsic temperature control and moisture resistance of wool makes it a fine candidate for setting bones. Today's farms are capable of generating and collecting large amounts of data, and we're interested in what people can do with this information – as well as what we might do with related science and technology in the future. For this project we traveled around the country, visiting merino stations, going to A&P shows and shearing competitions, and spending time in offices and labs. We've talked with breeders, growers, shearers, wool handlers, scientists, industry representatives, government policy makers and others – all so that we could learn about how NZ merino is grown and used. Then we took what we learned about people's hopes and concerns, and we started to imagine scenarios for the possible future production and consumption of merino sheep and products. I emailed with Galloway about the BoneKnitter, but also about the meaning of design fiction, creative approaches to research, and engaging publics with scholarship and artifacts. The BoneKnitter is a beautiful play on the actual medical terminology for how bones form and heal from injury—that they're literally "knitted together." I love how you evoke and also extend this process. Can you talk about the origin of that idea among your team? Thanks so much. I originally created a design brief around 3D printing that I called "WoolBot"—which wasn't very clever and didn't take us very far. To be honest, Dani Clode and I got bored rather quickly with the idea of making what would most likely end up be really expensive "crapjects." So, with a truly remarkable material at our disposal, and a real desire to look beyond luxury clothing markets, we decided to focus on biomedical and other protective textiles. There's excellent commercial merino products in this area already; for example, Encircle makes some of the best off-the-shelf compression therapy products in the world, and Armadillo creates incredible wool "armour" for combat, fire-fighting and other dangerous jobs. But, really, everything came together when I broke both my tibia and fibula, and dislocated my ankle joint. (Don't ask; it was stupid.) I spent many days in hospital for surgery and rehab, and was off work for quite some time. One day, Dani and I were sitting at my kitchen table comparing orthopaedic horror stories and scars (hers are elbow-related) and checking out my less-than-impressive fiberglass cast when it all fell into place: we simply had to redesign the whole experience! Once we got our egos and ambitions in check, we talked about how to best utilize Dani's industrial design and craft skills, and came up with the idea of a knitting machine. She showed me a video of someone hand-cranking an old Erlbacher Gearhart home knitting machine and everything just snowballed from there. I could say that the BoneKnitter name evolved after some deep thinking and discussion, but the truth is that I simply enjoy wordplay and when I shared my idea with the team, everyone liked it and it stuck. Having me going through the process of healing broken bones while we were designing it just made it all that much easier—as well as tangible. The BoneKnitter is one of several fictional scenarios you've proposed for public engagement with this larger human-animal-machine ecology. Those fictions are playful and also research-based. Can you talk about how you try to frame that back-and-forth, between fact and fiction? Our Counting Sheep research has been all about developing and testing different combinations of empirical cultural research and creative design research. Using sheep as a case study also allowed me to combine ancient and new technologies; the sheep was domesticated about ten thousand years ago, while the Internet of Things effectively came out to the public at this year's Consumer Electronics Show and we've yet to see where it will go. Of course, it also helped that ZQ Merino and Icebreaker's baacode service had already got the ball rolling in terms of merino traceability. Blurring the distinction between fact and fiction is something that's always intrigued me. Anthropology has long been described as producing "partial truths," because it's impossible to fully capture and represent entire cultures or the whole of human experience. And I can't imagine that anyone who's read a novel, or seen a movie, wouldn't tell you that at least part of it rang true to them. But I guess what I'm saying is that I'm interested in resonance—and since that doesn't ever need to choose between fact or fiction it's kind of a perfect concept for exploring creative empirical research. Speaking of the BoneKnitter specifically, I can say that it responds to three things voiced by participants in my ethnographic research. First, I was at a shearing and wool handling competition and an older Pākehā merino breeder told me that there would be no NZ merino industry if it weren't for the exceptional skills of Māori shearers and wool handlers, both historically and today. Second, a majority of people I interviewed described an unwelcome pressure to live and work at speed—something that is a bit newer in NZ than in North America and Europe, I think. And third, some people are genuinely concerned that traditional knowledge and hands-on skills are being replaced by technology, and they feel as if no one cares. To dismiss any of these people as nostalgic technophobes would demonstrate, I think, a profound disrespect and disservice—not to mention a real lack of cultural understanding. I've long been interested in how ubiquitous computing could care for us in ways that don't involve either voluntary or involuntary surveillance, and this cultural research reminded me of how I wanted to design something that might evoke an everyday relationship to new technology that comforts rather than worries people. As women working in male-dominated professions, Dani and I were excited to combine traditionally feminine craft with traditionally masculine technology, and we wanted to explore more natural materials because everything about sheep eventually leads back to the land. We also wanted to find ways to bring Rongoā Māori and traditional materials technologies together with Western science, and to develop an aesthetic that embodies these ethics. And finally, we wanted to use wool traceability as a means to evoke community connection and expression, and creating a generic device for NZ public healthcare would allow us to do so in a non-commercial, non-branded context as well. I think the BoneKnitter succeeds in doing all these things, at least to some degree, and I also like that it is deceptively simple. If I can take credit for any cultural and conceptual resonance the BoneKnitter has, it must be said that all of its material and visual resonance comes from Dani. It still sits in the corner of my office, and I often just sit and admire the quality of her craftwork. The barrel was machine cut from a large piece of wood, but she stained it all and hand-notched every one of those knitting needles! Dani also hand-knitted each swatch, as well as all three layers for the model cast. I recall a lot of swearing about working with the lace-weight, ultra-fine merino, but I can honestly say that the care she put into producing the BoneKnitter was nothing short of astonishing. It is truly an object of love, and perhaps even an object of grace. Say more about how design is activated, operative in your larger work. What conversations or relationships are you looking to foster? I think my favorite reaction to the BoneKnitter so far has been a friend's husband who was actually pissed off to learn that even though it technically could work right now, it doesn't actually work and wouldn't be manufactured because it isn't economically viable. "So it's just design wankery, then? ", he proclaimed. Designers may not want to hear these things, but as a researcher I was thrilled because he has a point. Mike Michael wrote an excellent article on differences between social science and speculative design's understandings of public engagement, and the importance of those individuals or publics that cannot or will not "properly" engage with our work. Since it's harder to measure disengagement than engagement, one of the primary challenges our research faces is how to account for these kinds of reactions or "misbehaviours." The Counting Sheep scenarios were only ever created for online exhibition—although people can download and print all the PermaLamb posters for personal use. And because we're interested in design as public engagement, we've put up a short, anonymous survey for people to share what they think - both good and bad. (Please, take our survey!) I'm also following up with earlier research participants to discuss the different scenario content in more detail, and to talk about our intentions and their expectations. As a cultural and creative researcher, my definition of "good" or "successful" design is based entirely on what our work can and cannot do in the world. I'm also really interested in teasing out differences and similarities between co-design and the co-production of knowledge, between speaking for and with others, as well as understanding how a single design both represents and performs or creates all sorts of things, including multiple publics. For me, much of the excitement comes from accounting for, and hopefully being accountable to, the range of actors at hand: institutions, people, animals, materials, objects, images, narratives, etc. More on Counting Sheep and at the Design Culture Lab. 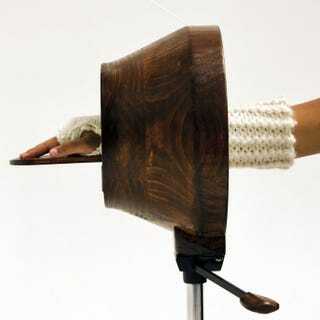 Images: A round hand-cranked wooden home knitting machine, based on those developed in the latter half of the 20th century, knits together a white wool cast onto a human arm, draping the knitted form on the arms as it passes through the machine. The wool is knitted on in three layers, from very fine to very thick, and the wool-flax top layer of cast is set with bio resin as hard as a fibreglass.